We can offer a full range of surgical procedures under general anaesthesia in our purpose built and fully equipped operating theatre. These procedures range from castration (gelding) of mature horses and hernia repairs through to colic surgery and arthroscopic (keyhole) joint surgery. In addition we perform a full range of upper respiratory tract surgery (wind operations) in conjunction with visiting RCVS Specialist JG Lane BVetMed DESTS FRCVS. 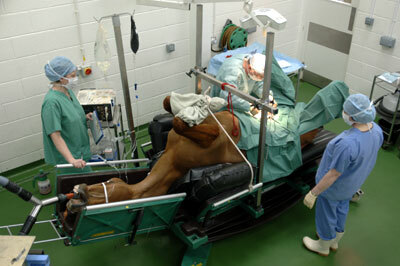 Other procedures often performed under general anaesthesia include flushing of traumatically infected joints, repair of large wounds and treatment of angular limb deformities in foals. Post operative care is facilitated by our 24 hour on-site nursing cover and hospitalisation facilities.